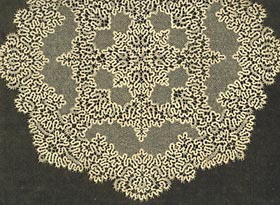 Unlike needlepoint lace, which is made with a single-thread technique using embroidery stitches, bobbin lace is made with a variety of multiple-thread weaving techniques. Groups of threads are plaited, interwoven and twisted. Fancy braids called "passementeries," had traditionally been made of gold, silver and colored silk, and most authorities believe that in the early 16th century this craft evolved naturally into the production of linen laces for decorative insertions and borders. 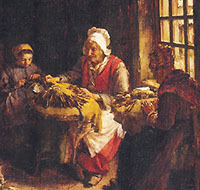 Although evidence suggests that the first bobbin laces were made in Venice, the craft spread quickly to Milan, Genoa, Flanders and other parts of Europe. Bobbin laces were softer, lighter in weight, and more suitable than stiff needlepoint lace for the fashions of 18th century Europe, and so reached their peak at that time in Flanders and France. 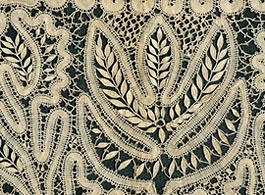 Bobbin lace can be divided conveniently into two groups on the basis of the working methods involved: first, non-continuous laces (à pièce rapportées), and second, so-called "straight" or continuous laces. I have grouped them separately here. Click on the links below to see large photos and magnified details of the structures. The laces here have all been sold, and are posted here purely for informational purposes. The term "continuous" may be confusing, as some writers talk of "continuous" bobbin tapes. 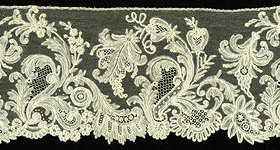 In a broader sense, however, "continuous" refers to laces made all in one -- pattern and ground together -- the antithesis of the braid or "trail" lace techniques. This elegant twelve-inch medallion was made with tiny bobbin-made trails of linen stitch and intermittent half stitch, a more open weave. The background was filled afterwards with a bobbin-made réseau (mesh). 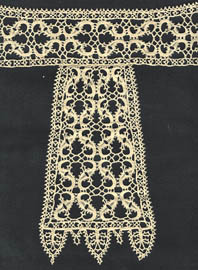 A similar approach on a larger and simpler scale has been used by lacemakers throughout Eastern Europe. 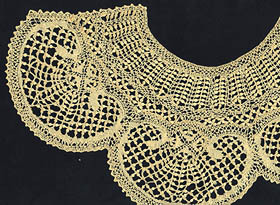 Similar work has sometimes been called "Idria" lace, suggesting that it originated in Slovenia. Since many settlers of that region were Czech or German, however, questions remain. 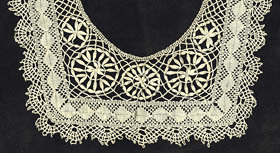 Hungarian and Russian lace makers have also produced several styles of braided lace. 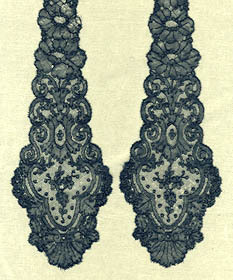 If anyone can direct me to information on the lace shown, I would be grateful. 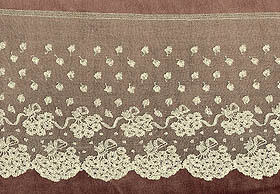 This Belgian lace style developed in the 1850's. Parts were constructed separately with filmy linen stitch or half stitch, and then assembled. Leaves were often veined with raised oversewn bundles of threads. 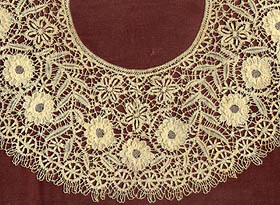 Since flower sprigs, leaves and scrolls were joined by braided plaits, lace like that in this collar could not be duplicated by machine. 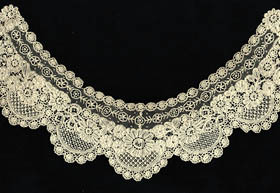 Although generally associated with Belgium, lace in this style was made in several places, including Mirecourt, France. The English counterpart was Honiton, which was made with slightly heavier thread and different fillings. 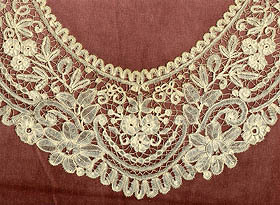 Here we see another exquisite lappet made in Flanders in the first half of the 18th century. This complex example was made with fine threads equal to those in the piece above, creating lovely transparencies. 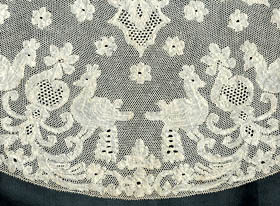 The motifs were outlined with a heavier thread, and a distinctive mesh ground was used. The design is composed of floral motifs along with scrolls and cartouches enclosing small trefoils. Made on the island of Malta, this lace collar includes the distinctive Maltese Cross. Along with its boldly scalloped forms, small flat leaves were used repetitively to display the shimmering luster of the ecru silk to best advantage. 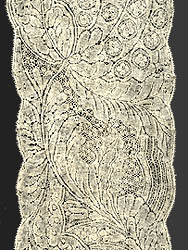 These typical wheat ears or leaves were copied from Genoese bobbin lace, and were present when the craft was revived in Malta in the 1830's. One further note: Written historical records, mainly merchants' accounts, leave the question of bobbin lace origins in doubt. The extant laces themselves, however, are much more informative. 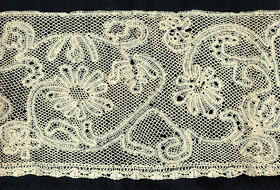 Nearly everyone agrees that techniques used by the makers of elaborate passementeries were those used for the earliest bobbin lace made with linen threads. Sixteenth century pattern books display motifs said to be for both decorative metal/silk trims and narrow linen trims, insertions and borders. 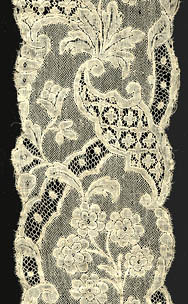 Among existing 16th century laces, however, only examples of Venetian bobbin lace are closely related to the passementerie designs in style, concept, and the technical processes revealed. Unfortunately, photos of these laces have not been widely published. On the other hand, the early laces of Flanders, Milan and Genoa differ significantly in character from the passementeries. They either imitate Venetian Reticella/Punto in Aria needle laces or are of the non-continuous type -- assembled braided sections that were later joined with mesh or bars. I wonder if anyone can cite published examples of early Flemish bobbin laces that are indeed related to the passementeries?